Part 1 Nanofiber production: Electrospinning of nanofibers; Producing nanofibre structures by electrospinning for tissue engineering; Continuous yarns from electrospun nanofibers; Producing polyamide nanofibers by electrospinning; Controlling the morphologies of electrospun nanofibers. Part 2 Carbon nanotubes and nanocomposites: Synthesis, characterisation and applications of carbon nanotubes: The case of aerospace engineering; Carbon nanotube and nanofibre reinforced polymer fibers; Structure and properties of carbon nanotube polymer nanofibers using melt spinning; Multifunctional polymer nanocomposites for industrial applications; Nanofilled polypropylene (PP) fibers. Part 3 Improving polymer functionality: Nanostructuring polymers with cyclodextrins; Dyeable polypropylene (PP) via nanotechnology; Polypropylene (PP)/clay nanocomposites; Multi-wall carbon nanotube-nylon 6 nanocomposites from polymerisation. Part 4 Nanocoatings and surface modification techniques: Nanotechnologies for coating and structuring of textiles; Electrostatic self-assembled nanolayer films for cotton fibers; Nanofabrication of thin polymer films; Hybrid polymer nanolayers for surface modification of fibers; Structure-property relationships of polypropylene nanocomposite fibers. Nanotechnology is revolutionising the world of materials. This important book reviews its impact in developing a new generation of textile fibers with enhanced functionality and a wide range of applications. 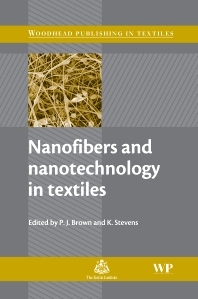 The first part of the book reviews nanofiber production, discussing how different fiber types can be produced using electrospinning techniques. Part two analyses the production and properties of carbon nanotubes and polymer nanocomposites and their applications in such areas as aerospace engineering. The third part of the book considers ways of using nanotechnology to improve polymer properties such as thermal stability and dyeability. The final part of the book reviews the use of nanotechnology to modify textile surfaces, including the use of coatings and films, in order to improve hydrophobic, filtration and other properties. Nanofibers and nanotechnology in textiles is a valuable reference in assessing and using a new generation of textile fibers in applications as diverse as tissue and aerospace engineering. Dr Phil Brown is an Assistant Professor in the School of Materials Science and Engineering at Clemson University. Dr Kate Stevens is a Research Associate in the Center for Advanced Engineering Fibers and Films at Clemson University.